It's the Most Wonderful Time of the Year! Send generous season's greetings with this gorgeous wine crate, complete with holiday decor followed by your own personalization. To add even more joy to the offering, a copper snowflake keepsake ornament arrives hanging around the neck of the bottle of wine you select. Choose Belle Taine California Red Blend, or Archery Summit Pinot Noir. For more information on this wine, please see the Tasting Notes. Enter up to four lines, up to fifteen(15) characters per line. Enter information to be embossed during the checkout phase of the ordering process. Engraved Wonderful Time of the Year Wine Crate is a hand delivered gift. These gifts are delivered by one of our local design centers located throughout the United States and Canada. Same day delivery is available for most gifts when ordered before the cutoff time. 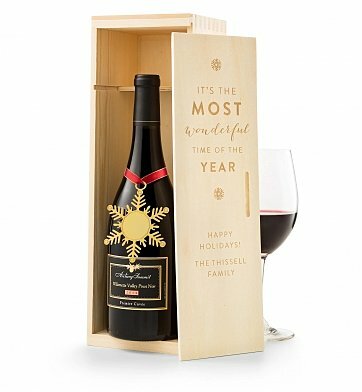 The cutoff time for Engraved Wonderful Time of the Year Wine Crate is in the recipient's time zone. We purchased 20 bottles from gifttree.com. Quality and value is excellent and they have wonderful customer service.